Drift fishing, or 'bottombouncing' as the Canadians call it, is the most popular technique for more accomplished steelhead anglers. Consisting of bouncing a weight in tandem with some form of terminal lure / bait along the river bottom, the hope is for a salmon or steelhead to pick up the offering as it bounces along. Although there are nearly as many terminal rigs as there are anglers for this style of fishing, we will focus on the rigs that we use in our boats. With 8 1/2 foot rods considered standard, many anglers choose rods of 9 to 10 feet or more as the longer rods offer greater line control and casting distance, albeit a little less accuracy. For winter steelhead fishing or silver salmon fishing, we run G. Loomis 1025 GL3 casting rods, for salmon fishing we usually run their heavier 1021 casting rod. Bob driftfishing for Spring Chinook on the Olympic Peninsula circa 1989. Level wind reels are far and away the best choice for most drift fishing applications. We run Shimano Calcutta 250's or Curado's on the casting rods in our boats. Spinning reels are sometimes used, but have three shortcomings: 1) the inability to control the spool on casts ... making for lesser accuracy; 2) the inability to free spool readily while actually drifting, keeping anglers from staying in constant contact with the bottom and making extended drifts; and 3) their tendency to wildly twist the line when reeled with a drag that is either at a stalemate with a fish or ceding line. We do offer spinning reels at times when we work with extremely light offerings, or if the level winds are just too awkward for the angler ... but we try to avoid using them when feasible. Mainline weights generally run between 12 and 15 lbs. 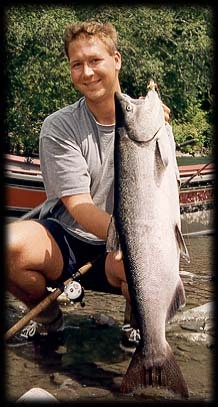 for the larger coastal steelhead ... for most salmon fishing 20 lb. test is usually sufficient. It is critical, however to use a very high quality mainline with medium stretch, moderate limpness, and a high abrasion resistance as the line often comes in contact with the bottom. We have found Maxima Ultragreen to be the best choice in these respects. The basic rig that we use starts with a leadcinch ... a basic size 7 snap swivel (we use only Rosco ... made in the US ... swivels for this setup, as cheaper imports can and do sometime separate under load) with a roughly one inch piece of tubing attached to the snap as a way of attaching the lead. For weight, a hunk of pencil lead is inserted into the rubber tubing. It is important that you only insert the lead about 1/3 of an inch, any further, and if the lead becomes hung, it will no pull free of the tubing ... the idea behind this setup. Attached to the tubing setup at one one is your mainline, at the other end, the terminal rig. Usually, these terminal rigs are attached by around 18 - 30 inches of leader ... this length depends upon water clarity and the size of lure used. An example of one of the many ways to attach your weight. These terminal offerings are usually called a drift bobber; they usually are buoyant, allowing the lead to stay right on the bottom, and the terminal bait / lure to ride just a little higher in the water column. They can be fished solo, or in tandem with bait. Below are three of our favorite drift bobbers. On top: a rag (found occasionally on a commercial basis, we make our own), the second one down is the marabou aerofly, the third is the 'lil corky. We prefer to use the top two in most of our fishing as they are foam based with either marabou or yarn, they are soft enough to allow a fish to hang onto this a little longer than a hard lure like the 'lil corky. In addition, the yarn and /or marabou also tends to get hooked up in the teeth of a fish, making the soft takes more pronounced and giving the angler a little longer to set the hook before the fish expels it. Remember that nearly all salmon and steelhead in a river ARE NOT feeding ... they pick up lures like these out of curiosity and will spit it right back out moments later ... anglers must strike fast! Hook sizes vary widely, but for most winter driftfishing we use size 2's to 3/0's depending upon the size of the driftbobber. Driftbobbers from top: rag, aerofly, and corky. Accomplished anglers with a level wind have a distinct advantage over spinning tackle anglers in the the 'swing' portion of the drift. By free spooling line as the lure travels downstream, they can counteract the 'lifting' tendency of the lure as it swings across the current, thus keeping the lure on the bottom and in the strike zone. In addition, you can make longer and slower drifts, especially in the latter end of the drift, giving you more fishing time when the lure is being presented in the most attractive way. As the lead and lure tick across the bottom, the angler must pay close attention to the ticks of the lead on the bottom ... any bump or pulling sensation could be a fish! The takes are often very light and be difficult for the new angler to sense. If you're unsure ... set the hook!!! After a while, you'll develop a 'sense' of what is bottom and what is a fish. Be patient! When the lure stops swinging across the current, simply reel in and repeat! Many people use bait in tandem with the drift lures. For salmon, eggs are the preferred bait, for steelhead, eggs, sandshrimp, prawns, and crayfish tails are the most popular baits. Normally, we fish sandshrimp most of time ... same (if not a little better) effectiveness in our eyes, a lot less messy, and a more durable bait if rigged properly. 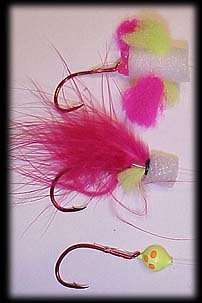 Visit our tips section to see our Rigging Sandshrimp page for instructions on how to do 'em up! Use longer leaders with smaller driftbobbers, shorter with smaller ones. Drop your lead to the bottom and see where the bait / lure rig positions itself ... ideally about 4-5 inches off of bottom. If you're having trouble getting down .. don't simply cast further upstream ... simply increase the amount of lead and resist the temptation to throw further upstream ... you'll snag up a lot less. Take a rainy day to fix up all your lead cinches ... keep 'em in a plastic Ziploc so you don't have to try to put the rubber tubing through the snap swivel with cold hands ... that hurts!!! When purchasing a casting (or spinning for that matter), don't be afraid to spend some money! 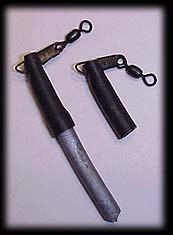 The better rods offer more sensitivity for picking up the lighter strikes and often weigh half as much as the cheaper ones. This might not seem like much at the tackle shop when you first pick up a rod, but it will make a big difference on that 'last cast' where you get that light bite! You're likely to to have better feel if you haven't been holding that heavy rod all day! The same can be said for the reel.